Fike has offices and manufacturing capabilities around the world with manufacturing facilities in the United States, Belgium, Wales, Canada and India. 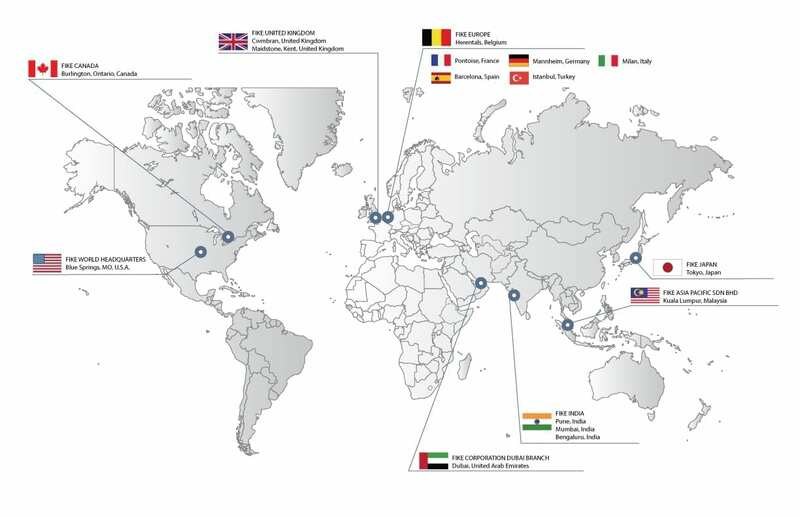 Fike’s sales and service offices are located throughout North and South America, Europe, Asia and the Middle East. This global reach gives us the advantage of interacting and consulting on a local market level, rather than from afar. It means designing product and service solutions that meet the requirements of international uses and standards. Fike Europe was founded in 1984 to serve our European customers through manufacturing, selling and distributing commercial protection systems, industrial protection systems, oilfield products and pressure relief solutions. Fike Europe has both manufacturing and warehouse facilities based in Belgium to meet customer needs quickly and develop custom customer solutions. Fike Canada was founded in 1985 to serve our Canadian customers through manufacturing, distributing and servicing Pressure Relief and Explosion Protection products. Consisting of manufacturing and warehousing facilities Fike Canada adheres to the highest standards of quality, resulting in a quality system in compliance with ISO 9001:2008. Fike Canada is also approved by other recognized standards including N285(Nuclear – TSSA), CSA Z299.3 and ASME VIII Appendix 10 (UD,NB). Fike Dubai was founded in 2009 to serve our fire protection and pressure relief customers in the Middle East and Northern Africa; and oilfield customers in these regions and throughout Europe. Fike Dubai sells and distributes clean agent and inert gas fire protection systems, fire alarm systems, rupture discs (bursting discs) and pressure relief products specifically designed for use in oilfield applications. Fike France was founded in 1988 to serve our French customers. Fike France, a part of Fike Europe in Belgium, sells and distributes industrial protection systems, oilfield products and pressure relief solutions. Fike Deutschland was founded in 1990 to serve our German customers. Fike Deutschland, a part of Fike Europe in Belgium, sells and distributes industrial protection systems, oilfield products and pressure relief solutions. Fike India was founded in 1999 to serve our Indian customers by selling and distributing industrial protection systems and pressure relief products. Fike India’s large warehouse facility ensures on-time delivery of customer orders. Fike Italia was founded in 1991 to serve our Italian customers. Fike Italia, a part of Fike Europe in Belgium, sells and distributes industrial protection systems, oilfield products and pressure relief solutions. Fike Japan was founded in 1980 to serve our Japanese customers by selling and distributing industrial protection systems and pressure relief products. Fike Japan’s large warehouse facility ensures on-time delivery of customer orders. Fike Asia Pacific was founded in 2000 to serve our Asian customers by selling and distributing industrial protection systems and pressure relief products. Fike Asia Pacific’s large warehouse facility in Malaysia ensures on-time delivery of customer orders. Fike Iberica was founded in 1994 to serve our Spanish customers. Fike Iberica, a part of Fike Europe in Belgium, sells and distributes industrial protection systems, oilfield products and pressure relief solutions. Fike Turkey was founded in 2015 to serve our customers in Turkey and Caspian Region. Fike Turkey promotes and supports industrial protection systems, pressure relief solutions, oilfield products, clean agent fire suppression and watermist fire protection system and fire alarm systems. Fike United Kingdom was founded in 1985 to best serve our British customers. Fike United Kingdom, a part of Fike Europe in Belgium, sells and distributes industrial protection systems, oilfield products and pressure relief solutions. Since 1999 Fike have manufactured, supplied and distributed Fike Clean Agent Gaseous Fire suppression and Watermist fire protection systems to UK, European and Global customers. In 2009 Fike acquired Rafiki Protection Ltd. which added Extinguishant control systems and Fire Alarm product Products to the product portfolio. All of these products are now available from the new Fike United Kingdom offices in Cwmbran. Provides support from Houston, Texas for Latin America and Caribbean countries [including Brazil]. FIKE Latin America sells and distributes industrial protection systems, pressure relief solutions, oil and gas application and fire protection.